If possible, remove outdoor shoes in the house, otherwise ensure that you have good external and internal door mats at external doors. Use felt pads and castor cups on furniture. Do not drag furniture over the floor. Damp clean only when necessary with minimal water and a slightly damp cloth or mop. 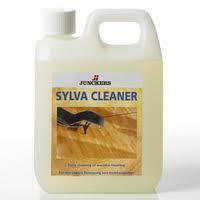 We recommend a cleaner appropriate to your finish (see cleaning). Maintenance Cleaning – Intensive Maintenance Polish (matt) we recommend that perhaps every 3-4 months that you apply intensive maintenance polish. Clean floors first with either Careline Easy Clean or Careline De-Wax (if your floor has previously been treated with Intensive Maintenance Polish). This is a hard wearing wax for refreshing worn and tired looking surfaces of lacquered & UV oiled floors, leaving a long lasting and slip resistant finish. 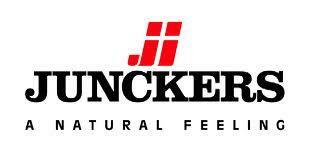 Apply with a flat microfiber mop – do not dilute. Drying time is approximately 1 hour. Careline easy Clean £9.99 / Intensive Maintenance Polish £24.99 / Careline de Wax £14.99 - Buy any 2 products and get 10% off!! Regular Cleaning – Treatex Floor Care is available in a 1L bottle to dilute 25-50ml in 5L of warm water – use a well wrung out mop. Or Treatex Spray On Floor Care is a pre-diluted solution to be sprayed onto the floor and applied with a damp mop. 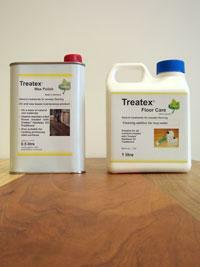 Treatex Floor Care contains vegetable oils and waxes to nourish your oiled floor. Treatex Floor care £12 / Treatex Spray on Floor care £7.20 / Careline Intensive Clean £11.99/ Treatex Wax Polish £21.60 – buy any 2 products and get 10% off! !